The US Supreme Court ruled last month that police officers who violated "knock and announce" search warrant rules could use the ill-gotten evidence against defendants, but that's not good enough for at least one Vermont judge. In a Monday opinion, District Court Judge Robert Bent threw out the evidence in a "knock and announce" search where police rushed the home as soon as the door opened while they were gathering out front. Under centuries-old common law and decades of US legal practice, most search warrants require police to knock and announce and allow the resident a reasonable time to answer the door. Police who can convince a judge special circumstances require them can apply for a "no-knock" warrant. Last month's Supreme Court ruling effectively gutted the "knock and announce" requirement -- at least in the federal courts. Vermont should hold itself to a higher standard, said Bent in the case of Ellen Sheltra, who was arrested on marijuana charges after the cops rushed her door. "Evidence obtained in violation of the Vermont Constitution, or as the result of a violation, cannot be admitted at trial as a matter of state law," Bent wrote, citing an earlier state case as precedent. "Introduction of such evidence at trial eviscerates our most sacred rights, impinges on individual privacy, perverts our judicial process, distorts any notion of fairness and encourages official misconduct." In their dissent in the US Supreme Court case, four justices warned that allowing police to use illegally obtained evidence would lead to police officers ignoring the law. Bent agreed. "The exclusionary remedy should remain in full force and effect," Bent wrote, "at least in our small corner of the nation." The district court decision is not binding on other judges, but they are likely to take it into consideration in deciding similar cases. Prosecutors have not decided whether to appeal Bent's ruling to the Vermont Supreme Court, where, if it is upheld, it would become binding. California Gov. Arnold Schwarzenegger (R) Wednesday signed into law a bill that substantially alters the state's voter-approved Prop 36, the state's "treatment not jail" law. One of the authors of the measure, which mandates treatment not jail for first- and second-time drug offenders, immediately filed suit to block the law from going into effect. The bill, which was tacked onto a budget bill and passed last month, allows "flash incarceration" of up to five days for people who have failed to participate in treatment programs. Championed by law enforcement and drug court professionals, the new law stands in stark contrast with the initiative approved by the voters, who approved Prop 36's "no jail" provisions by a wide margin. Under California laws, substantive changes in voter-approved initiatives must be done by the voters, not the legislature. Prop 36 coauthor Cliff Gardner filed his lawsuit Wednesday afternoon in Alameda County Superior Court. 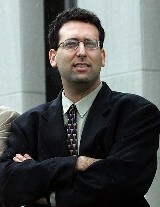 He is being represented by Drug Policy Alliance (DPA) attorney Daniel Abrahamson. "Rather than veto SB 1137, the Governor opted to engage in a legal battle over what he knows is an unconstitutional law," said Abrahamson in a statement. "We have filed a complaint in Alameda County Superior Court, and are confident that Prop 36 and the will of the people will be upheld." But Lisa Fisher, a spokeswoman for the California Department of Alcohol and Drug Programs, told the Associated Press the state would enforce the law unless a judge orders it not to. "We think that the reforms are furthering the purposes of Proposition 36," she said. "The one thing we have learned over the years is that jail sanctions need to be part of a whole package of sanctions that an individual can expect." A federal judge Tuesday gave final approval to a landmark settlement in the case of the heavy-handed 2003 police drug raid on students at Stratford High School in Goose Creek, South Carolina. Under the terms of the settlement, the Goose Creek Police Department, the City of Goose Creek, and the Berkeley County School District will pay $1.6 million for violating the rights of nearly 150 students caught in the raid. The trio also signed a consent decree barring police from conducting law enforcement activities on school grounds absent a warrant, probable cause, or voluntary consent. Caught by both school and police surveillance cameras, video of the raid helped make the case a cause celebre. The tapes show students as young as 14 forced to the ground in handcuffs as officers in SWAT team uniforms and bulletproof vests aim guns at their heads and lead a drug dog to tear through their book bags. Authorized by Principal George McCrackin because he suspected a student was dealing marijuana, the raid came up empty: no drugs or weapons were found and none of the students were charged with any crime. "They hit that school like it was a crack house, like they knew that there were crack dealers in there armed with guns," said 14-year-old Le'Quan Simpson, who was one of the students forced to kneel at gunpoint in the school hallway and whose father served on a SWAT team. Simpson's father, Elijah Simpson, a local deputy sheriff who has served on SWAT teams, said, "This was clearly a no-shoot situation no matter how you look at it. A school drug raid is not a SWAT situation, but that's how the Goose Creek police handled it." The police raid was unnecessarily dangerous, the older Simpson added. "It was crossfire just waiting to happen. If one door slammed, one student dropped a book or screamed, and then those guns would have gone off all over the place. Did you see the way they were swinging those guns around? That's not how you do it." Following the raid, the ACLU brought a lawsuit on behalf of students' families charging police and school officials with violating the students' right to be free from unlawful search and seizure and use of excessive force. The lawsuit demanded a court order declaring the raid unconstitutional and blocking the future use of such tactics, as well as damages on behalf of the students. Joined by local attorneys, the lawsuit grew to include 53 of the affected students. ACLU Drug Law Reform Project. "They are the only students in the nation who have complete protection of their Fourth Amendment rights of search and seizure." Marlon Kimpson, a lawyer with Motley Rice LLC, the firm that represented most of the students, said students involved in the drug sweep must file claims by July 28. A claims administrator appointed by the court will then evaluate each student's claim and determine which students are eligible for the funds, Kimpson said. "Any student who was searched and seized on Nov. 5, 2003, is now eligible for compensation and they have received notice of that," Kimpson told the Charleston Post & Courier. "It is now incumbent on the students to take action and have their claim considered." Under the terms of the settlement, the affected students will divide $1.2 million among themselves, while the lawyers will pocket $400,000. Depending on the number of students who agree to the settlement, each could walk away with between $6,000 and $12,000. The powers that be have learned a lesson, said Kimpson. "McCrackin is no longer in charge, the police have agreed to additional training and school district has vowed to change its policies with respect to the way they conduct drug raids," Kimpson said. "You must conduct drug searches according to the US Constitution. This settlement and this class-action lawsuit is notice to police officers and school officials across the nation that students don't shed their constitutional rights merely by entering a schoolhouse door." In Newark, New Jersey, six police officers were indicted Tuesday on charges they warned a drug ring about police raids in exchange for drugs. The six were arrested over the last 18 months, but officials only took the case public upon their indictment. Passaic County Chief Assistant Prosecutor Jay McCann said what began as "a social relationship" between the officers and their drug-dealing contemporaries escalated into law breaking and corruption. Those arrested were Pompton Lakes officers Dennis DePrima, 30, Robert J. Palianto, 29, and Michael Megna, 34; West Milford Officer Paul Kleiber, 26; West Paterson Officer Richard Beagin, 26; and Passaic County Sheriff's Officer Gerry Ward, 46. Each was suspended and faces charges including conspiracy to commit official misconduct; conspiracy to possess narcotics; official misconduct; witness tampering and hindering apprehension. 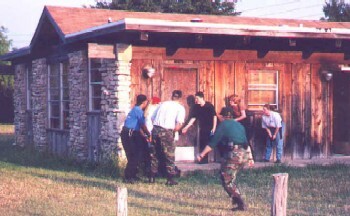 The conspiracy unraveled after authorities figured out a suspect in a 2004 drug raid had been tipped off and investigated. The drugs involved included the prescription sleeping pill Ambien, cocaine, Oxycontin, and anabolic steroids. In Altoona, Pennsylvania, a part-time state park ranger was arrested Saturday on meth dealing and related charges. William Ickes, 61, a ranger at Blue Knob State Park was charged with three counts each of possession and delivery of drugs, as well as additional drug and weapons charges. State officials allege that Ickes sometimes sold drugs in the park while in uniform. During an April raid on Ickes' residence, police seized a pipe bomb and various guns, plus methamphetamine, marijuana, hallucinogenic mushrooms and drug paraphernalia. Ickes is jailed on a $150,000 bond. In Albuquerque, a Metropolitan Detention Center guard was arrested Monday night on charges he conspired to smuggle heroin into the jail. Guard Marcus Urias, 19, went down after accepting a pack of tobacco, a gram of heroin, and his $150 fee from a man who turned out to be an undercover agent for the Bernalillo County Sheriff's Department. Urias faces charges of drug trafficking, conspiracy to traffic drugs, and conspiracy to bring contraband into a prison. Urias was jailed and fired. In "Race to Incarcerate," Marc Mauer, executive director of The Sentencing Project, explores the political, financial, and human toll of the "get tough" movement against crime and assesses why this policy has failed, making a compelling argument against the unprecedented rise in the use of imprisonment in the United States over the last 25 years. Race to Incarcerate also brings to light the devastating reality of disenfranchisement -- for example, 13 percent of African American men are ineligible to vote because of criminal convictions -- in ten states more than one in five black men are barred from voting because of their criminal records. We also continue to offer the DVD video Law Enforcement Against Prohibition and the 5th edition of Drug War Facts -- add $5 to the minimum donation to add either of these to your request, or $10 to add both. Again, visit http://stopthedrugwar.org/donate/ to make your donation and place your order, or send a check or money order to: DRCNet, P.O. Box 18402, Washington, DC 20036. (Note that contributions to Drug Reform Coordination Network, which support our lobbying work, are not tax-deductible. Deductible contributions can be made to DRCNet Foundation, same address.) Lastly, please contact us for instructions if you wish to make a donation of stock. 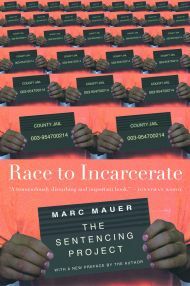 Washington, DC, "Race to Incarcerate," book talk with The Sentencing Project's Marc Mauer. At Politics & Prose bookstore, 5015 Connecticut Ave., NW, visit http://www.politics-prose.com for further information. This section presents the racial profiling documents released by the New Jersey Attorney General's office on Monday, November 27, 2000, amid controversy and acrimony.